Beautiful day today. Sunny, not a lot of wind, and temperatures to be close to 70. Tomorrow is supposed to be another today….weatherwise. Through the weekend, we will see a drop in temperatures; into the 50s and partly sunny. This cold front will stay with us through the middle of next week, but by Thursday, we will move into the low to mid 60s. However, right now there is a chance of rain by next Friday. Projection for today is lots of water all day. May drop it back around noon, but it will still be around 705-706 feet elevation. No clue what tomorrow will bring, but I think we will see some water. Table Rock Lake is now at 915.1 feet due to the rain and snow we had last weekend. 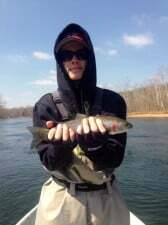 Gina had a fun day on the water with two new fly fishers, Jordan and Nick. 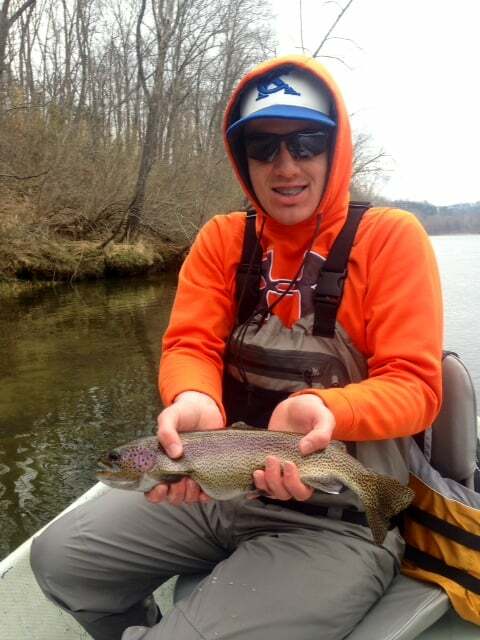 Jordan took our full day fly fishing clinic last year and know this was the sport for him. He brought along his friend Nick and they spent half a day with Gina learning and catching. Best patterns stripping were the CQ streamer and tiger tail. Drifting was the blue poison tungsten beadhead in a size 16. Jordan and Nick have been friends since third grade and will now probably be fishing buddies for life. Welcome to the wonderful world of fly fishing!!! This entry was posted on Thursday, March 20th, 2014 at 11:43 am	and is filed under Fishing Reports. You can follow any responses to this entry through the RSS 2.0 feed. You can leave a response, or trackback from your own site.